What's your car worth? 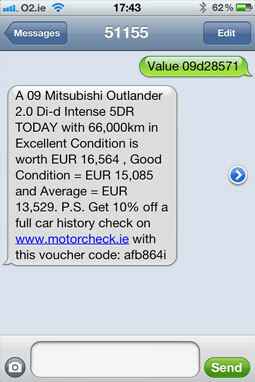 Get an instant value from Textcheck by sms- Powered by Motorcheck.ie, Ireland's leading car history check company. 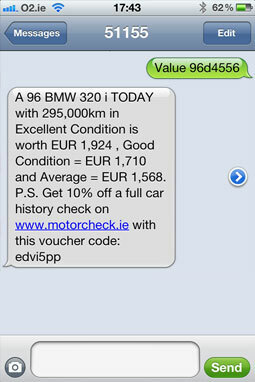 Looking for a Car Value in Ireland? Have you bagged a bargain or are you being taken for a ride? Check its value BEFORE you offer anything by texting the word VALUE followed by the reg to 51155. It could save you a small fortune! Don’t run the risk of putting potential buyers off and waste valuable time waiting for offers that never come. Make sure your asking price is realistic and fair BEFORE you advertise your car. 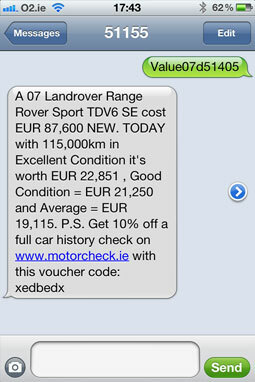 Textcheck is now available to O2 & Vodafone customers. Special rates for Trade users!